Models available in assorted colors, sizes and ages. Giving Assistant makes it easy to donate to Texas Adopt A Greyhound Society Inc.! Simply shop online, earn cash back, and donate as much as 30% of your purchase price—Giving Assistant facilitates the whole process. 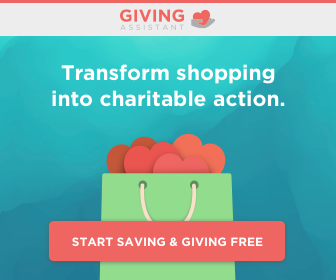 Now, you can help change the world for free while saving money at over 2,500 popular online retailers like Joann (2%), Target (2%), and Macy's (7%)! PayPal and Credit Cards accepted online! TAGS has been given a new opportunity to raise money for our Greyhounds. Enchanted Life Travel will give TAGS a donation for every vacation booked through them. Just mention TAGS to them when you set up your trip. Amazon will donate 0.5% of the price of your eligible AmazonSmile purchases to Texas Adopt A Greyhound Society Inc whenever you shop on AmazonSmile. The company that makes the Thunder Shirts for dogs donated four X-large gently used Thunder Shirts to TAGS. TAGS is offering these donated shirts for a donation to TAGS of $30.00 each. If you live in the Dallas area and wish to pick up the Thunder Shirt, no shipping charges will be incurred. If you live outside the Dallas metroplex and wish to have the Thunder Shirt mailed, you will be responsible to pay the shipping charges of $9.85. Please help TAGS by helping your dog be more comfortable during thunder storms. Your donation may be made through Pay Pal or by check. Purchase a Thundershirt for TAGS - click link above! Size for a Greyhound would be XL or L (for a smaller girl). Petfinder has partnered with Thundershirt to help put your adoptable dogs at ease. Thundershirt is a proven solution for many types of anxiety including noise, crate, travel, stranger and separation anxieties. Over 85% of Thundershirt users are reporting significant improvement in anxiety symptoms. TAGS is now a member of the Randalls/Tom Thumb Good Neighbor program. TAGS’ number is 12304. You can link TAGS’ number to your Remarkable/Reward Card. Then the amount of each of your grocery purchases will be added to TAGS’ account every time you use your card. Randalls/Tom Thumb will send TAGS a check quarterly representing one percent of the total amount in TAGS’ Good Neighbor Account. This is a perfect way for you to help TAGS raise funds. Please stop by the Courtesy Booth at Randalls, Simon David or Tom Thumb and fill out a form linking your Remarkable/Reward Card to TAGS’ account number 12304. Join iGive free and help TAGS as you search the Internet or shop online! Why not help Texas Adopt a Greyhound Society, Inc. (TAGS) with every search? Make iSearchiGive your homepage, and use our Yahoo!-powered search engine to raise a penny for every qualfiied search. It'll even help you find deals and bargains! USBones.com - click here to go directly to US Bones and start shopping to help TAGS! Rawhides - From the raw ingredients to the manufacturing labor, these high quality treats are 100% USA! Let a retired racing Greyhound race into your heart!